A Canadian husband and wife share the same design ideas for their getaway. Designing a dream home is rarely an easy task—especially when spouses have ideas at opposite ends of the spectrum. For Gabriel and Amanda Hagg, however, this clearly wasn’t the case. In fact, creating the perfect plan was surprisingly simple for this Canadian couple. “My wife and I are lucky enough to share virtually identical taste in architecture and design,” Gabriel explains. “So there was absolutely zero bickering over any design decisions between us on this home.” Warm and Contemporary Drawn to the distinctive look of custom wood homes, Gabriel and Amanda knew they wanted to incorporate natural materials and showcase the beauty of nature in the getaway that they planned to build in Montana’s Flathead Valley. The couple wanted to marry clean lines to the warmth of natural materials. 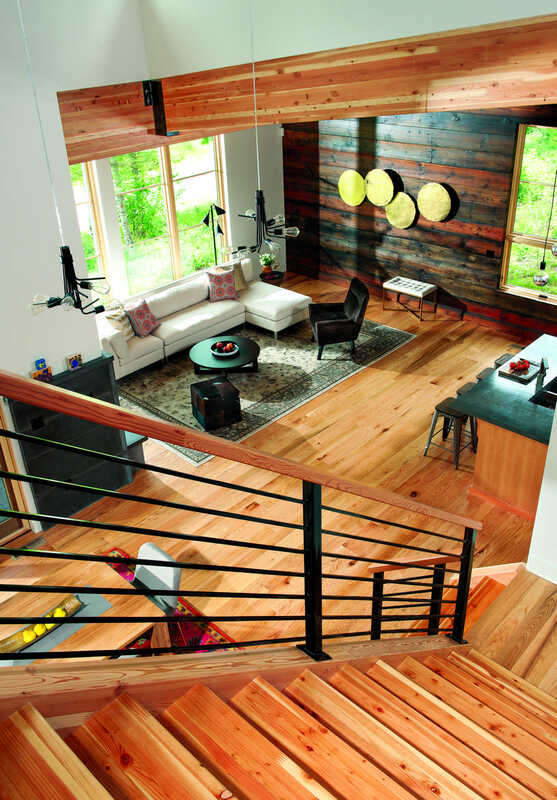 “We wanted a home that would fit in with its mountainous, wooded surroundings,” Gabriel says. The surroundings that the Haggs chose are more than inspiring—in fact, the Haggs liked the Montana setting so much that they ended up buying the entire development rather than just one lot. The site, located in Columbia Falls, overlooks the Swan Range, Bad Rock Canyon and Great Bear Wilderness into Glacier National Park. The family has fallen in love with Montana, and especially the Flathead Valley area. “There’s so much to do, and so much local charm and hospitality,” Gabriel explains. To create a floor plan that would reflect the beautiful setting, the Haggs turned to Montana Creative Architecture + Design, and Tom La Chance of La Chance Builders, both based in Whitefish. “It was a blank-canvas discussion and it became a thing of real combined input from all of us,” Gabriel recalls. After the Haggs expressed what they were looking for in their dream home, architect Ron Nash and the team at Montana Creative Architecture + Design helped to make it happen. The couple was keen to blend the exterior and interior spaces and make a strong design statement. The Flathead Valley is inundated with chalet and lodge architecture. “We wanted to use the same material palette, but give the client a home that would give the area a distinctive, modern flair,” Nash says. The ideas generated led to a “modern mountain” cedar cabin accentuated by plenty of reclaimed barn wood elements. “We wanted an open, airy home that was bright, but not aloof,” Gabriel says. “We used a mix of woods—the varying characteristics create a lot of visual and textural interest.” Glulam, or laminated, beams were employed throughout to maintain the clean-lined look. The cabin’s distinctive design makes a big impact. “The mountain modern look definitely sets it apart from anything else in the Valley,” says Brian Murphy of Rocky Mountain Real Estate, the company that handles marketing for the development. “The straight rooflines combined with the wood create such a unique feel to the home.” Blending Indoors with Out The highly functional floor plan provides ample space for the Haggs and their two young daughters. The 2,430-square-foot custom wood home features twin master bedroom suites on the main level, an open loft and an additional guest suite upstairs. Best of all, the design captures the beauty of the outdoors. “A big emphasis of the design is to maximize natural light,” Gabriel says. “The house features lots of energy-efficient windows which are perfect for capturing the gorgeous views toward Glacier National Park. Why have tiny windows and dark walls when a Montana setting just begs for the outside to be brought in? I mean, it’s Big Sky Country with nature’s bounty out there…why not be able to see it?” Rugged materials used inside continue the theme of bringing the outdoors in. 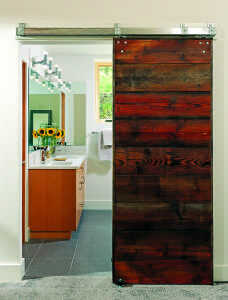 The material palette includes reclaimed barn wood, natural siding and clear-stained glulam beams. “We even used architectural-grade plywood on half of the ceilings to further add a woodsy tint,” Gabriel says. The plywood contrasts well with the white walls and clean lines of the home. The building process was remarkably smooth, highlighted by an easy permitting experience and zero delays. Even the weather was manageable. “Building through a Montana winter was not really daunting for us, coming from Canada,” Gabriel says. The Haggs were also confident that choosing local builder Tom LaChance put their project in good hands. “Tom and his crew always took the time to ask questions and make suggestions—he really grasped what we were going for pretty early on.” Restoring the Spirit Whenever the Hagg family spends time at their dream retreat, they love to sit back and simply savor the sense of serenity, especially in the kitchen where they like to hang out and soak up stunning sunrises. “Lights floods in and makes it the most serene morning coffee spot I’ve ever seen,” Gabriel says. Summers at the home are especially memorable for the Haggs. “It is so much fun with our girls,” Gabriel says. Evenings are spent on the roofed-in front patio, watching the sunsets reflect off the mountains to the east. “Every day is a real adventure for my little girls,” he says. “There is no shortage of exploring and animal watching to do and take in.” The family finds the pace of life in the Flathead Valley to be wonderfully restorative. 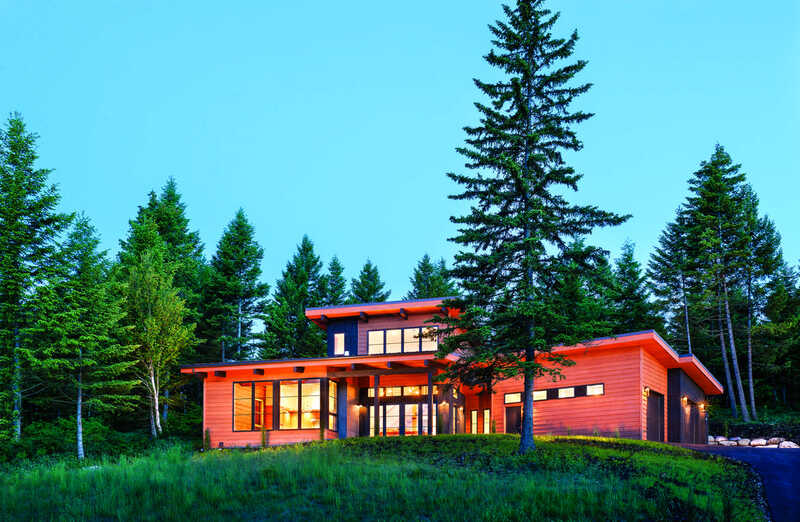 Looking at the tranquil retreat, it’s easy to see why the Haggs feel so relaxed when they are there—and why the couple had no trouble agreeing on the perfect cabin design to grace the setting.